Back engraving line 1. Maximum of 12 characters or spaces. Back engraving line 2. Maximum of 12 characters or spaces. 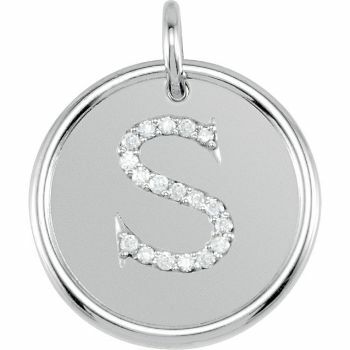 Posh Mommy Roxy's initial diamond pendant has beautiful raised edge. Available in Sterling Sliver, 14K yellow or white gold or Vermeil 18K yellow gold plated. Pinpoint setting style genuine diamonds. This item is sold separately. Optional chains are available for purchase. Note that when you purchase gold charm and chain option is selected, the gold chain color will match the pendant. Generally takes 5-7 business days for production. Please read required engraving method. Engraving on the back is optional on 2 lines. Bradley hand font name/s will be engraved all lower case including first initial. Exp: jackie. Jasmine font can be engraved upper case or lower case. Block font can be requested upper case, 1 character only. Please contact us if you're unsure how to place your order.